Calling all film buffs! Looking for short stories that fit your interest? Editor David Wheeler has you covered. 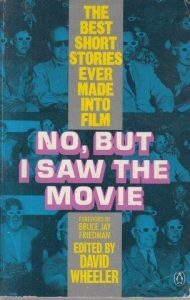 No, But I Saw the Movie: The Best Short Stories Ever Made into Film collects the gems that inspired the marvelous scripts of classic movies, including two that became Academy Award Best Picture winners (It Happened One Night and All About Eve). Spotlighting a lush variety of short fiction including westerns (High Noon), musicals (Guys and Dolls), suspense (Rear Window), science fiction (2001: A Space Odyssey), comedy (Mr. Blandings Builds His Dream House), and horror (Psycho), this anthology will help you appreciate both the authors of the source material and those who recognized the genius that could be adapted into great entertainment.